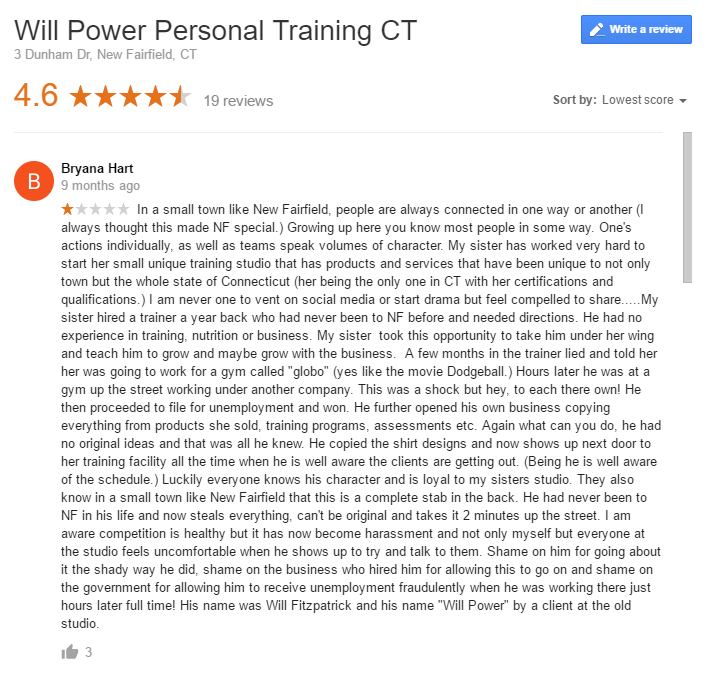 I feel like I shouldn't need to explain why I left Earthfit Personal Training in New Fairfield, CT. Most people I know that my wife was pregnant.. I was working part time..
Getting paid $13.50 an hour..
and not being able to implement the training that I wanted to. Honestly, I should have known better or I should have quit earlier. But I didn't, instead I believed everything that came out of Seana Hart's mouth. She told me at my initial interview that I'd be making $50K a year within the first year. She told me she'd cover my medical insurance, pay for new certifications, and wanted to incorporate my Olympic Weightlifitng & Powerlifiting background into their programs. Instead I found myself teaching a training that I didn't agree with, folding towels and getting up at 4:30am to work for 4 hours, take a break to come back for the night shift. I kept telling myself that this was something I just needed to endure. I convinced myself that if I kept training hard that I'd be rewarded for my hard work. Six months of working at Earthfit went by. My hours were cut and my wife was getting worried. Heck, I was getting worried. At this point I started seeking other work. I interviewed with a guy named Charlie who had a company called Revive Fitness. Given the circumstances I was currently in my mindset had changed dramatically. I didn't believe a word that Charlie was telling me in the interview. He said he was expanding to other locations, and his personal training company was growing immensely. He said I could be making $60K in the first 6 months of training with him. I let Seana know that I was looking and received an offer to stay. I let Charlie know that I decided to stay, but would keep him in mind if I was looking again. Four months went by and my offer to stay wasn't fulfilled. My wife was even more pregnant and we we're getting really close to the due date. I made a straight Pro/Con list of staying at Earthfit or moving to Revive Fitness. I realized that my trusting rate with Seana was only 20% and with Charlie it was 30%. I didn't believe a word that either of them told me, but Charlie was going to pay me more. He also told me that he'd teach me the art of selling. I was supposed to learn that at Earthfit, but didn't. I knew that my sales skills needed to be strong if I was going to make it as a personal trainer. I gave Charlie a call and boy was he thrilled to hear from me. Turns out he was in New Fairfield too! I let him know that I didn't want to be right next door to Earthfit, because that wasn't the right thing to do. He let me know that he had an opening at Brewster World's Gym. He could get me 5 clients within the first week. I put in my 2 weeks at Earthfit. I gave her Seana some constructive criticism about her training program as I had suffered an elbow injury just weeks earlier. I didn't tell her where I was going. We left on good terms with a sturdy handshake. I was ready to fulfill my 2 weeks, but she persuaded me otherwise. She was still technically my boss so I just did what she told me to do. I then went up to Revive's headquarters at Prime Time Fitness to fill out the paperwork in order to get started in Brewster that night. 2 hours later on my way over to World's Gym in Brewster I received a weird call from Seana. She explained that she followed me up to Prime Time Fitness, and said I was a liar. I explained the situation in which that was their headquarters and I was working at Worlds Gym that night. I figured it was fine. Brewster wasn't that close to New Fairfield. The next day as I'm heading into Prime Time for Sales Training I get heads up that I've been slammed on Earthfit's Newsletter. Not just slammed, but just brutalized. The attack on my character was completely uncalled for, and I was pissed. Who does that? It was unbelievable! Three days go by and I've setup 7 assessments in Brewster, NY. Charlie sees that I'm a hard worker and offers me a promotion to a manger spot in New Fairfield... I'd be getting a base salary + commission. It was a hard decision, because I didn't want to be disrespectful to Seana and the other ladies at Earthfit. Myself, Joanne and Diane had a ton of fun times at Earthfit. I didn't want to be that guy! At the same time I had to think about the family and the fact that I was hammered by Earthfit's newsletter a short couple days ago. I decided to go for the manager position at Revive Fitness's New Fairfield location. As I expected I caught some crap for moving so close, but I was catching crap anyway. 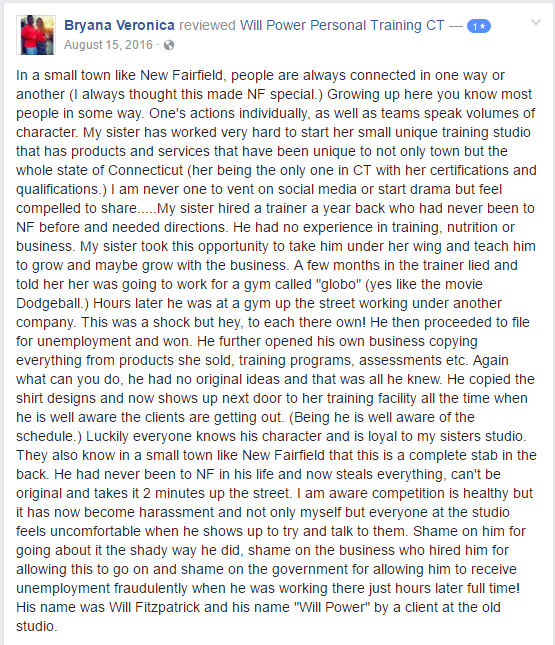 Two months went by and I was noticing the same problems as I did while working at Earthfit New Fairfield CT. I had bigger problems to deal with than my aversion to how I should train clients... That month I didn't get a paycheck. I started getting calls from Brewster about fraudulent charges on client's credit cards. Charlie was no where to be found. Two weeks went by and I was still without a paycheck. I crushed that month too. I signed up 4 new clients. Another 2 weeks went by without a single paycheck. I realized my first year of getting back into Personal Training was filled with 2 horrible bosses and I was making less money than working with youth. I didn't know what to do. A year ago I was training part-time while working full-time as a Sports, Fitness & Recreation Director at a youth program. I quit that job to pursue a more financially stable job in the Personal Training industry. I had been doing personal training on the side since early freshman year in college. Will Power Fitness was born after making a decision to go out on my own. If Charlie & Seana could have successful personal training businesses than surely I could. I made an agreement with Prime Time to keep the rental of their facility going. The owner, Pat was nice enough to give me some leeway on the first few months of rent. Will Power Fitness thrived. I did the type of training that I wanted to. People lost weight and loved it. I could be funny in sessions. I could train mindsets more than just bodies. I could be the facilitator of change for people looking to make changes in their lives. Two months later my baby girl, Chloe was born. That same day I got slammed on social media by Bryana, Seana's sister. It was unbelievable. She this paragraph of absolute non-sense on my Facebook Page and Google My Business Listing. When I texted her to see what that was all about... she replied "Get out of my town". I was dealing with this crap while laying in a hospital bed holding my daughter for one of the first times. I shouldn't have had my phone on, but I did. The statements made in these reviews we're outrageous. "He had no experience in training, nutrition, or business"
She's right that I had no experience in business, but very wrong about training & nutrition. "He copied the T-Shirt designs..."
Does my Logo look anything like Earthfit's? Maybe to a blind guy. "He opened his own business copying everything"
Heck, there's nothing to copy. I left Earthfit partially because of their training methods. It's a glorified boot camp. There is no corrective exercise programs, very little personalized programming, and very little time between rounds to correct form. I showed up to Starbucks a couple of times to get coffee. I'd always end up talking with a few of her clients. Which really wasn't cool on my part. However, I felt inclined to at least attempt to clear my name. That's the reason I'm writing this blog now. I feel like I need to clear my name a little bit. It's not just me working with a couple clients at Will Power Fitness, but instead I've got a team of trainers. For their sake, I feel that I need to set things straight. Most people would put bad reviews on their page too. What happens if we start that war? We both bleed. It's not worth it for either of us. I'm sure that Seana will eventually see this. She'll read it and I'll either get a call directly or hear something through the grape vine. So Seana, this is a message to you. If you want to spend your time slamming me on social media - go right ahead. However, if you want to focus your time positively I'd love to connect again. A lot of New Fairfield residents are moving to World's Gym in Brewster, Fitness Edge, and will be going to Orange Theory in the spring. Those gyms and personal training studios hurt both of our businesses. If you'd be willing to remove those reviews on my social media pages I would gladly work with you to grow both of our businesses. You're an entrepreneur. I'm an entrepreneur. If we worked together to make New Fairfield the mecca of fitness it would greatly improve both of our businesses. I've got the plans ready to be implemented to bring people back into New Fairfield, but I'm having a very hard time scaling. I'm personally fully booked with clients. My most reliable trainer is also fully booked with clients. I personally don't have enough trainers to take all the new people. Your personal training business can scale easily. You'll lose people to me, and I'll lose people to you. We both are going to lose people to Orange Theory, and we both are already losing people to World's Gym & Fitness Edge. Let's put our differences aside and work together to make New Fairfield the #1 town in Western Connecticut for Health & Fitness.